Investigations into the 15 foot-deep hole that appeared in a central reservation located between junction 5 for Sittingbourne and junction 6 for Faversham is still continuing after the hole was filled with 40 tonnes of pea shingle yesterday to stabilise it. The crater that measures five metres by two metres wide and it is about 15 metres deep, opened up two days ago (Tuesday) causing panic and gridlocking motorists. The sinkhole is believed to be caused by the extensive and heavy rainfall. The Highways Agency has announced that it opened lane one and the hard shoulder London-bound and the hard shoulder coast-bound just after 6am today, with the hard shoulder being used to allow traffic to pass the hole, but investigations are continuing on the ground under the road. Geotechnical investigations are trying to find the cause to allow the repair to be safely completed so that the remaining lanes can be reopened to traffic. 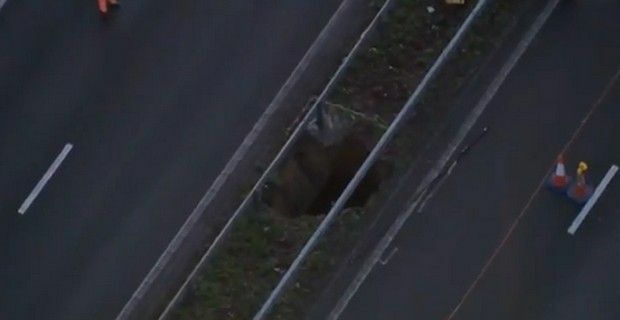 The Highways Agency expects that a full assessmentof the hole will take at least another 48 hours . On a less serious note, the M2 sinkhole has become famous enough to warrant its own Twitter profilethat already has 261 followers since it was created a day ago. Someone with a hilarious of humor has decided to be the “Bad boy of the M2. Bringing you all the inside info on the chaos I'm causing! Get the hole story here!